Reputation is one thing in this life that can not be bought, it can only be earned. The Winchester 40gr .22 long rifle Super-X is a round that has earned its reputation for accuracy and outstanding performance through decades of engineering and experience. The Winchester 40gr .22 long rifile Super-X utilise copper jacketed hollow point rounds to ensure for a quick, humane kill for those looking to repel varmints on their property. 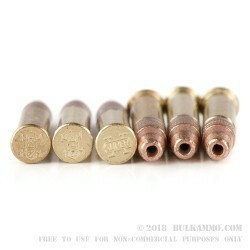 Unlike traditional .22 long rifle rounds that are cast from soft point lead and do not have a copper jacket, Winchester Super-X rounds will not foul your barrel with lead, and are instrumental in preventing premature expansion of the hollow point cavity upon impact with fur and other tough surfaces. At a average muzzle velocity of 1,28o feet per second, you can accurately scavengers and other pests for distance as great as 100 yards and beyond. 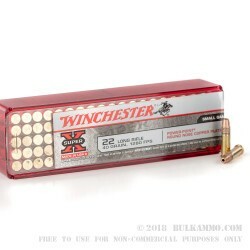 If you are looking for a hard hitting, accurate, and affordable round, the Winchester 40gr .22 long rifle Super-X is the answer you have been looking for. good product, easy feed for ruger 10/22. Q: What is the muzzle velocity of this ammo? A: Hello Glen! 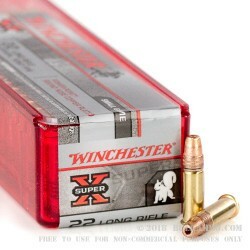 According to Winchester, the muzzle velocity of this ammunition is 1280 fps.